Organised by a group of scholars in the Division of Languages and Intercultural Studies and other divisions of the School of Arts, Languages and Cultures, University of Manchester, UK. citizen media practices and piracy. Stuart Allan is Professor of Journalism in the Media School, Bournemouth University, UK, where he is also the Director of the Centre for Journalism and Communication Research. He is the author or editor of sixteen books, the most recent of which is Citizen Witnessing: Revisioning Journalism in Times of Crisis (Polity Press, 2013). He is a founding co-editor of the peer-reviewed journal Journalism Education, and serves on the editorial boards of several other journals. He is currently engaged in research examining citizens’ uses of digital imagery in news reporting, while also writing a history of war photography. Bolette Blaagaard is Assistant Professor at Aalborg University, Denmark and former Research Fellow at City University, London, where she was involved in setting up an international network to debate issues of citizenship and journalism, as well as carrying out research on citizen journalism and its implications for journalistic practices and education. She is co-editor of After Cosmopolitanism (Routlege 2012) and Deconstructing Europe (Routledge 2011). Mona Baker is Professor of Translation Studies at the Centre for Translation and Intercultural Studies, University of Manchester, UK and is currently leading the Citizen Media at Manchester initiative. She is author of In Other Words: A Coursebook on Translation (Routledge, 1992; second edition 2011) and Translation and Conflict: A Narrative Account (Routledge, 2006), Editor of the Routledge Encyclopedia of Translation Studies (1998, 2001; second edition, co-edited with Gabriela Saldanha, 2009); Critical Concepts: Translation Studies (4 volumes, Routledge, 2009); and Critical Readings in Translation Studies (Routledge, 2010). She is also founding editor of The Translator (St. Jerome Publishing, 1995-2013), former Editorial Director of St. Jerome Publishing, and founding Vice-President of IATIS (International Association for Translation & Intercultural Studies). Ivan Sigal is Executive Director of Global Voices, a community of more than 700 authors and 600 translators around the world who collect and make available reports from blogs and citizen media everywhere, with emphasis on voices that are not ordinarily heard in international mainstream media. He is author of White Road (Steidl Verlag 2012) and has extensive experience in supporting and training journalists and working on media co-productions in the Soviet Union and Asia. Stephen Ennis is Russian Media Analyst at BBC Monitoring, a branch of the BBC that monitors foreign broadcasts and other forms media activity. In seeking to investigate the ways in which ordinary people find themselves compelled to engage in first-person reportage, this plenary presentation strives to illuminate a number of issues warranting close and careful elucidation. To describe those involved as ‘citizen journalists’ may be advantageous in certain circumstances, in part by acknowledging that their actions are recognisable as journalistic activity, but such a label brings with it certain heuristic difficulties too. 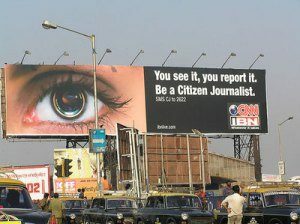 As we shall see, discourses of ‘citizen journalism’ reveal an array of virtues in the opinion of advocates striving to transform journalism by improving its civic contribution to public life – and conceal a multitude of sins in the eyes of critics intent on preserving what they perceive to be the integrity of professional practice – in complex, occasionally contradictory ways. My primary aim in this plenary is to discern a conceptual basis for formulating an alternative perspective. More specifically, I will offer an evaluative appraisal of diverse attempts to think though the journalistic mediation of witnessing with a view to assessing, in turn, certain wider implications for research investigating ordinary citizens’ impromptu involvement and participation. In the course of this discussion, I shall elaborate the concept of ‘citizen witnessing’ as one possible way forward to negotiate the conceptual territory fiercely lit by clashing assertions over whether journalism will thrive or perish with ever-greater public involvement in newsmaking. While the difficulties are formidable, they are not insurmountable. I shall argue that journalism’s public service assurances may be imagined anew in light of the capacity of citizen witnessing to enhance democratic cultures. In meeting this challenge of innovation, journalism will benefit by securing new opportunities to reconnect with its audiences in a manner at once more transparent and accountable, while at the same time encouraging a more openly inclusive news culture committed to greater dialogue, deliberation and debate. Technology is an increasingly important part of viewing imagery today and enables imagery to become part of a global cultural flow (Appadurai, 1996). Along with traditional photojournalism and broadcast media, we are experiencing images posted on Instagram, Flickr and YouTube on an almost daily basis. This presentation will discuss the relationship between what may be termed classical theories of photography put forth by theorists like Barthes (1967, 1979), Benjamin (1968) and Sontag (1977, 2003), and visual citizen media, in particular mobile phone footage, in order to explore whether theories of photography still apply in a technologically saturated world of imagery. Is Barthes’ idea of the traumatic image still relevant to our experience of citizen media images, for example, and if so, how may we theorise it in light of our own affective and embodied involvement in media consumption and production – in what I will argue is a post-human (Braidotti 2013; Hayles 1999) experience? The physical connection between viewer and image here is called into question: the link between vision or representation, human eye (i.e. the physical body),and knowledge production is continually at the core of our understanding of evidence (Daston and Galison 2007), of what is true and authentic. I will be posing the question of what happens to that connection when not only the image but also the physical body is mediated and challenged in post-human relations and with what ethical implications. The presentation will take visual citizen media, and in particular mobile phone footage, as a starting point for an exploration of the (post-human) body as evidence and sign of authenticity in times of digital communications and journalism. This talk will examine the genesis, principles and dynamics of groups of translators and interpreters who are actively involved in global movements of justice, and who specifically use their linguistic skills to extend narrative space and narrative opportunities for resistance. The groups in question set out to empower voices made invisible by the global power of English and the politics of language. Their use of hybrid language, their deliberate downgrading of English, the constant shuffling of the order and space allocated to different languages on their websites – all this is as much part of their political agenda as their linguistic mediation of texts and utterances produced by others, in their capacity as translators and interpreters. It is this practice of prefigurative politics that is particularly interesting and that distinguishes them most clearly from other groups of translators that offer linguistic support to humanitarian organizations and a variety of good causes. In many ways, discursive as well as behavioural, they practice the principles they support themselves, rather than remaining within the rigid boundaries of their professional role and entrusting the political work to others, at the same time as advocating these principles and enabling others to articulate them in a range of languages. They apply the principles, often in highly innovative ways, in the present, rather than work towards applying them at some point in the future, when certain tangible and well defined political aims have been achieved. The presentation will focus on aspects of the workings of these groups and the way in which they overlap with or depart from other types of contemporary movements, with particular reference to the way they use translation and interpreting as an alternative space for political action at a global level. Is online citizen media becoming a global movement? In the past years we have seen a rise in citizen and social media for free speech and political change that is characterized by the will of individuals to act. We have watched how small numbers of bloggers and digital media activists on all continents have mobilized large movements and new political behavior over time. What is the driving force behind this activity? And can these individual acts of online activism in countries that are far from each other together be considered a “global movement”? How do such movements actually function in the context of political and social change? Behind these questions sits the contentious issue of the meaning of citizenship, and civic engagement, beyond the borders of the nation-state. How do we create and sustain transnational online communities and movements, and how do we imagine our own identities as part of those movements? This talk will examine both the experience of Global Voices in constituting and sustaining a large, multilingual and transnational online community, and look to other examples and experiences. A reactionary political backlash has swept Russia since Vladimir Putin’s re-election to a third presidential term in March 2012. Alongside greater restrictions on free assembly and tighter control of the internet, there has been police aggression towards anti-government demonstrators and the use of the legal system to persecute political opponents. Away from the direct political struggles, however, the picture is not so bleak. Following rapid growth of internet access, well over half of Russia’s population is going online and many are doing so everyday. Most Russians use the internet for private entertainment purposes – chatting with friends on social networks, downloading videos or helping their children with their homework. Increasing numbers, however, are getting involved in the many nascent forms of online community activism. Inspired by the online attention to recent natural disasters, individuals have gotten involved in charity work, even signing up as volunteers for relief operations. Others have been engaged with projects to improve housing and public services. Parallel to this, the official policy of bringing more government information online has given activists the opportunity to hold public servants to greater account. Albeit it in a fairly rudimentary way, what appears to be evolving in Russia is something akin to David Cameron’s aspiration for Britain – a Big Society, whereby the possibilities associated with internet access become possibilities for the individual to make a difference in their community. The diffusion of mobile and online networked practices has not only interrupted the integrity of the traditional domains of work and home, but also their domain-specific practices and values. Subsumed within a relational domain of everyday citizen communication, these practices provide a space for the citizen to cope with and temper the bleed of work-related pressures, to renegotiate divisions between work and home, public and private space, and ensure a degree of temporal sovereignty in their daily practices. Importantly, this occurs in coordination with their social peers, and thus also allows citizens to mutually negotiate an emerging set of values associated with networked communication in everyday life. Drawing on fieldwork conducted as part of a wider partially-grounded qualitative research project, this presentation focuses on three associated elements of such collective negotiation: a sense of authenticity, perceptions of technologies, and a notion of recursive spaces for meta-communication. Through a unique pairing of Goffman and Elias, I argue that these individually held notions are social acts in and of themselves, defining the boundaries and geometry of the social world. The presentation will challenge and extend the boundaries of what constitutes interpersonal communication between citizens, offering a potential space for negotiating not just interpersonal relationships, but also many of the wider temporal and social conventions that are woven into the management and structure of everyday life, in short for negotiating everyday politics. This presentation explores the possibilities for ‘digital citizenship’ that are emerging through digitally supported processes of narrative exchange (storytelling, story archiving, commentary). Such processes use digital media and digital infrastructures to recognise people in new ways as active narrators of their individual lives and the circumstances in which they live. Starting out from the question, what would a culture (or cultures) of citizenship look like? (Couldry 2006), we consider what new cultures of citizenship might be emerging, and what might digital resources, and the ‘communities of practice’ (Wenger 1998) focused around them, contribute to their preconditions? We propose the term ‘digital citizenship’ as a heuristic concept for examining the parameters whereby practices and conditions related to digital media and infrastructures for the exchange of narrative content contribute to broader civic culture (Dahlgren 2003; 2009). We approach these questions through a review of three streams of action research recently conducted in the North of England whose primary aim has been to explore the social conditions and digital platforms required for new processes of narrative exchange and knowledge production. We have worked in a variety of institutional settings – educational (a school and a sixth form college), civil society (a community reporter group, a local club) and residential (a local tenants association) – shaped by a diversity of large-scale factors: state regulation of education, the decline of arts and community funding, and, more widely, the withdrawal of state support to poor sections of the population – all in a context of prolonged economic recession. In each setting, starting out from the existing aims of particular institutions, groups and communities, we have built research projects for tracking and, if possible, supporting sustainable processes of narrative exchange and knowledge production. Our entry-point into such complex contexts was our understanding of the principles of digital storytelling as a tool for enabling and deepening mutual recognition within a wider framework of socially based democratization. Amateur photographic image-making has become culturally valuable as a form of witnessing and ‘citizen journalism’. This was highlighted most clearly during the reporting of the London Bombings in which news organisations actively solicited photographs created by non-professionals caught up in events. Academics have sought to reflect upon this as a moment in which news professionals were challenged to redirect their thinking and practices. But while such images were initially valuable because of their rarity, I will argue that they did not so much present professionals with a challenge but more an opportunity to rework existing structures of media participation. ‘Citizen’ photographs, in this specific context, accrued a certain status because of the source from which they came. Their value stemmed primarily from the fact that they were amateur productions, which were considered ‘ethical’ forms of ‘witnessing’ and ‘testimony’, believed to be equipped to evade the problems that had come to be associated with professional reporting. This presentation traces the construction of amateur image-making as offering an ‘alternative’ and ‘authentic’ perspective, particularly at the time of the bombings. It also considers how the amateur offers a vital and sustaining memory form, key within new media and its social participatory environments. It assesses the culturally transformative potential of the amateur and highlights the need to consider the particular reliance on a too simple model of opposition – between the professional and amateur, institutional and non-institutional – particularly in relation to contemporary forms of photographic practice. The EU, IMF and European Central Bank present the crisis in Greece as the doing of its people. Greeks are supposedly lazy, tax-avoiding reckless spenders whose payback time has been long overdue; indiscriminate harsh economic measures are thus justified. This presentation focuses onInformation Libre, a group of young left-wing activists based in Greece and abroad, who film protests in order to challenge this dominant narrative and promote their alternative solutions to the crisis among Greek and non-Greek viewers. They interview striking workers and demonstrators, add English subtitles to their videos and publish them on youtube. The paper explores the political and translational principles underpinning the activists’ use of media and subtitles and the relationship between these principles, based on interviews conducted with members of Information Libre with different roles within the group (subtitler and camera-person). I will argue that first and foremost their practice is informed by political objectives, i.e. the desire for social justice and radical social change, and, as regards subtitling, also by professional ethics in terms of translating accurately, seeking feedback from group members and viewers, and debating such feedback. In documenting campaigns that attract no attention from mainstream media, these activists take on diverse roles: as witnesses of and participants in these events, but also as filmmakers and historians of protest movements. Being fully aware of the diversity of roles and the tensions they may create, they declare their partiality, draw on past artistic and social movements, and network with activists in other countries. Their strategic use of media is a rejoinder to the current crisis, part of a broader repertoire of developing tools for resistance, and demonstrates the power of media in propagating counter-hegemonic ideas. China is officially composed of 56 ethnic groups: 55 minorities and a Han majority. One ethnic group, the Uyghur, have been involved in a series of violent conflicts with the Han in recent decades. The most serious of these conflicts took place in the Xinjiang Uyghur Autonomous Region in 2009 and claimed 197 lives. Mainstream Chinese media attributed the conflict to ‘separatism, terrorism and religious extremism’, while Western media treated it as an instance of ‘racial discrimination and oppression’. Social media allowed ordinary citizens to construct and promote alternative narratives through self-mediated news content. In particular, an online post about a street brawl between Uyghur nut cake vendors and a Han customer caused instant uproar among Chinese netizens and generated more than 2.5 million blog posts on Sina Weibo, a Chinese version of Twitter. Sina bloggers (mostly Han) adopted the perspective of the Han customer and expressed outrage at the large compensation paid to Uyghur vendors for their damaged cakes. ‘Nut cake’ thus became a buzzword on China’s social media. The initial post was followed by various spoofs, ranging from parodic poems and fake advertising slogans to satirical news. This presentation will examine the process by which netizens turned this street brawl into a national critique of China’s ethnic policy. More specifically, it will explore the factors that triggered this social media carnival and the nature of the challenge it posed to China’s ethnic policy, as well as the Chinese government and foreign media responses to it. It will also consider the extent to which such social media interventions might influence Uyghur-Han relations in the long run. Network activism is political action focused on increasing public access to the means of production on network communication systems. It shares some similarities with the theory of the recursive public as it was developed to articulate the discursive and collaborative work of free software geeks who also modify network communication systems, often for political purposes. Like free software geeks, network activists such as public television producers and community WiFi and low power FM radio activists, dialogue and collaborate to change the technologies and policies impacting their productivity. The theory of the recursive public has its limits however in conceptualizing network activism. Recognizing this, the talk offers the theory of proformation, a more inclusive and political version of the recursive public. With differing magnitudes, proformations share with recursive publics the following qualities: political orders, organized inclusion, policy constraints, media granularity, capital intensifications, and labour hierarchies. This presentation explores network activism and recursive publics while defining proformations through an analysis of interviews, observations, and historical data gathered from Free Speech TV (FSTV), an American public television news network. We are responding to a century that has witnessed a proliferation of theatrical forms of activism perhaps unprecedented in its global scale, from the occupation of Seattle by an emergent global justice movement in 1999 to the more recent uprisings across the Arab world that led to a million citizens gathering in Tahrir Square in Cairo in 2011. Artists and performance groups have often played an active role in protest events, drawing on bodies, text, image, movement as imaginative projections against the perceived order of things, and as tactical interventions and communicative tools. In this new collaborative research project we are exploring contemporary and historical practice through a range of approaches, including a bloghttp://activistperformance.wordpress.com/. The blog offers the idea of ‘gesture’ as an open-ended stimulus for contributors, signalling the aim to offer a thick theorisation and documentation of theatre and performance as an activist aesthetic. We have been inspired, in part, by Giorgio Agamben’s short essay ‘Notes on Gesture’ (2000), which explores an idea of gesture as ‘pure means’ – refusing the separation of action into means and ends, as categorised for this or that proper use. Gestures of protest in recent times – camping, occupying, marching, striking, moving in cells (to avoid kettling for example), swarming, dancing, going in disguise, impersonating, playing, staging, chanting, networking, blogging, hacking, tweeting – carry traces of former activist modes, and extend the domains of activism from the public life of the street and the theatre stage, to the private domain of the mobile phone and laptop. Much attention has been paid in recent years to the ways in which digital technologies facilitate citizen engagement and foster democracy, with scholars frequently conflating these two related yet distinct concepts. This presentation aims to analytically disengage the two, by looking specifically at what is often seen (and even more often discarded) as merely ‘anti-democratic’ practices: digital racism, the use of the Internet to facilitate hatred, and joyful online celebration of violence. I will argue that many practices of participatory digital cultures are organised around violence, and as such call on us to rethink the idealistic view of citizen media as solely a tool of political, communal and democratic empowerment. Instead, it is imperative that we address the complexity of ‘citizen engagement’ itself. Ethnographically, the talk will draw on my decade-long engagement with the ways in which ordinary people deploy digital communication tools to constitute sexual, ethnic and national identities, and to take part in negotiations of citizenship and belonging. 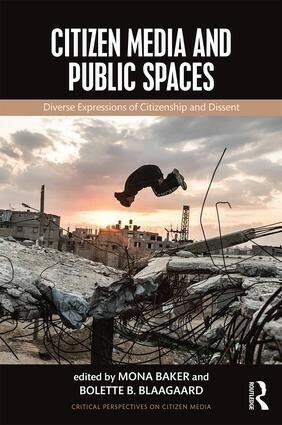 This has ranged from research on a queer migrant community in Israel/Palestine; to the analysis of the Russian-Jewish-Israeli diasporic blogosphere; to observations of digital Israeli nationalism at times of military operations in Palestine. The common thread in all this work is my interest in ordinary citizen violence – its affective economies and its cultural imageries, its seductive power and its bargaining value. I am especially interested in the political effects of living with violence as a citizen who is also a perpetrator, a spectator, a bystander, and a complicit colonial settler. The democratic potential of the Internet can enable novel opportunities of civic engagement for immigrants who often occupy a subordinate position in the political and media sphere of their country of residence. There is now a considerable number of blogs, web-zines and videoblogs originating in Italy which are operated by young citizens with an immigrant background. Established in response to under-representation and misrepresentation of the immigrant population in the mainstream media, these new media platforms offer alternative viewpoints and opportunities for self-representation and intercultural dialogue. The need for alternative, ‘intercultural’ media aimed at ‘giving voice to the voiceless’ also offers evidence of an emergent second generation or ‘new Italian’ civil society demanding visibility and participation in the national public and media sphere. This presentation will examine the recent and fast-growing development of these forms of citizen media in contemporary Italian society. It will consider how the need to reform Italian citizenship legislation based upon the principle of ius sanguinis is expressed and demanded through second-generations activism via media practices and campaigns. Drawing upon preliminary research that explores the contexts of production, discursive styles and substantive content of citizen media websites operated by young Italians, a case study will be presented of one important project, Yalla Italia: The Blog of the Second Generations, to demonstrate the strategic practices of intercultural citizen media in Italy as a form of journalistic and political intervention. The emergence of social media has enabled a whole host of shifts in cultural production. On the one hand, it has empowered ordinary citizens to push the boundaries separating producers and consumers and to exploit multi-modal means to produce content. These shifts in production challenge knowledge hierarchies and re-configure power relationships between experts and ordinary people, potentially facilitating the democratization of information and access to the public sphere. On the other hand, social media also commodify social relations and can undermine citizen-oriented frames of participation. Based on an analysis of key elements of Facebook’s changing user strategies, like the introduction of the ‘promote’ button and the work of Facebook’s ‘monetization’ department (part of its Global Marketing Solutions organization), this presentation will look at how social media erase citizen-oriented behaviour. It will argue that Facebook provides an immersive platform which encourages users to participate in the commodification and monetization of social relations. In this sense, Facebook promotes new strategies of control based on an emerging social ‘discipline’, one which enrols users in the search for the most ‘consumable’ advertising strategies and in developing increasingly intrusive advertising metrics. All of these elements are integral parts of Facebook’s internal machinery and work towards extending advertising and consumer reach. The presentation will question the ways in which personal networks and individual connections facilitate Facebook’s broader aims of monetizing social relations, arguing that corporate social media erase citizens from the social media agenda. This presentation will report on a research project that involved conducting interviews with 50 volunteer translators who work for the Italian edition ofGlobal Voices and who fall into three categories: experienced professional translators; less experienced and amateur translators (including students on translation, interpreting and language-related degrees); a wide range of professionals and activists. Interview questions addressed a range of issues, such as the extent to which the experience of translating for Global Voices has impacted the volunteer’s conception of translation; the extent to which Italian translators for GV come into contact and interact with each other; whether they subscribe to or empathize with the stories they translate/write for GV; and, importantly, whether they conceive of their translation work as a form of “citizen witnessing”. These questions are intended to reveal the senses of transnational and/or translocal ‘citizenship’ activated in citizen media translation projects, using Global Voices as a case in point. The provisional findings suggest that citizen translators working for the Italian edition of Global Voices construct their community not as a mere aggregation of individuals who interact around the central task of translation, but as a ‘living’ network held together by a sense of identification with a set of common values and powerful narratives that underpin a new sense of transnational and translocal citizenship. The In Place of War digital platform is a living archive of art, music, theatre and spoken word coming out of sites of armed conflict, and features some of the most creative work and ground breaking citizen-led initiatives in the world. Developed in collaboration with citizen journalists, creative artists, political activists, social media developers, international academics and technologists, the platform documents the use of citizen media as a form of protest, solidarity, activism and reconciliation. The In Place of War platform is thus an open space for creative individuals to exhibit work that would otherwise be lost. Beyond the digital platform, In Place of War is also a research and practice initiative that examines creativity in sites of armed conflict. It has documented arts programmes in conflict zones internationally, from Gaza to Goma, DR Congo and Sri Lanka to Sudan. The project seeks to explore how less technologically enabled environments can benefit from web technologies to overcome their isolation, and create and share artistic responses to war. This presentation will discuss the history of the project, the questions that arise in developing artistic responses to war, and the ambitions of the newly developed digital platform for artists to share their creative responses to war, conflict and revolution. Short form, real-time, network driven content has already re-factored publishing and media around the world. With the internet providing an infrastructure and utilities like Twitter, Facebook and YouTube providing a publishing platform, the stage is set for global distribution of this real-time content and access to the conversations that daily surround the most important content. As research has shown, however, perceived notions of a “global conversation” are in reality limited by language and geography. Even as theoretical channels for global interaction are opened up, in reality access to information and opportunities for engagement outside one’s language community are restricted. This presentation will discuss some of the work being done to translate citizen media, including the challenges – both from the perspective of translators and technologists – that it raises. It will offer an alternative vision for global social networks, where social translators play an important role as curators, creators and participants, and where translation is considered a necessarily social practice.